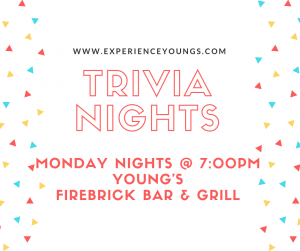 Test your smarts every Monday night at Young's while you enjoy dinner & drinks at FireBrick Bar & Grill! Time: Mondays at 7:00pm Prizes include a $25 gift car or drink tokens. **no cell phone use allowed** MC'd by the fantastic, Mike Mitchell!